Industry professionals understand the risks line workers face all too well. However, many customers may be surprised to learn that installers and repairers are among the top ten most dangerous jobs in the country. This statistic includes fatal work injury rates, according to the Bureau of Labor Statistics. Many others suffer non-fatal injuries from electrical burns and mechanical trauma. 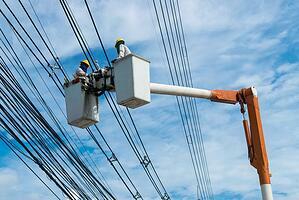 The leading cause of injury is worker contact with overhead power lines. The amount of voltage carried along electricity wires can range from a few thousand volts to over 100,000 or more. At the same time, the average age of utility poles in the United States is nearing projected life expectancy. Between the physical structure and electrical capacity, utility poles and other parts of the plant have the potential to cause a lot of damage. Utility workers’ jobs are essential to the daily function of our country’s network asset infrastructure – they ensure that power and communication flows to hospitals, schools, businesses, homes, streetlights, retail stores, and airports. Without them, everything goes dark. It is crucial that safety measures continue to evolve to reduce the risk for these important and necessary jobs. measures dictated by the National Electric Safety Code, OSHA and individual utilities and communications companies, as well as extensive training and certifications. While safety measures address commonly expected situations, often the unexpected is most dangerous. The U.S. continues to face aging power and communications infrastructure. It is common for technicians to locate equipment failures on the job, and previously unknown field conditions of assets due to aging equipment, poor communications, and out-of-date records. This puts field workers at even greater risk. Among all these stressors, attachment weight and pole overloading are fast-growing threats. Demands on field assets continue to increase as communications build-outs expand further, creating changes more quickly than asset owners can track. Often there are situations in which a utility pole is leaning or otherwise damaged and needs to be replaced, but the pole owner doesn't have visibility into those safety risks. It is difficult to feel in control without access to critical, time-sensitive data. This lack of empowerment has created infighting and conflict between asset owners and attachers. Simply put, it’s better when all industries involved in joint use work together. If field workers cannot be appropriately prepared for the current conditions – due either to a lack of available data or incorrect data – their health and safety are unnecessarily at risk. To protect employees and the public from injury, regular asset inspections are necessary. In many cases, risk can be greatly reduced simply by removing double poles, also known as double wood or "buddy poles." In our next article, we will discuss strategies for improving regular asset inspections and the associated data management. Are your organization’s employees safe in the field? What measures has your company taken to improve safety? Let us know in the comments below.